New Year’s Dash, the equivalent of the Raw after WrestleMania, has come and gone and in its wake there were a lot challenges made, as well as a big change within the Bullet Club. It was a newsworthy show in terms of what we’ll be seeing in the next month for New Japan. Aside from one angle, which I’ll cover further down this article, it seemed like the big news that broke Monday afternoon had no effect on this show or the booking for the next month, so we’ll see what happens from here. Decent, fun match. Cheeseburger was immediately over in Korakuen Hall. Everyone loved his offense, which was pretty much every one of his opponents no selling it because he’s so tiny in comparison. He is pretty great in his role; he looked so miniscule next to Nakanishi. There was one point in the match where Fujiwara slapped and headbutted him after he motioned for a high five or something. I guess Fujiwara isn’t a fan. It boiled down to Taguchi and Komatsu after Koshinaka took down Cheeseburger with a hip attack. He and Taguchi did a double hip attack on Komatsu then Taguchi followed it up with the dodon for the win. Fujiwara headbutted Cheeseburger again after the match. That’s not very nice! Really good, fast paced match. Sydal and Ricochet are just an excellent team, they gel really well together. If they continue to tag here in 2016 they’re really going to be something special. White and Finlay held their own and looked awesome here. In terms of rookie of the year for 2015 it’s a very close race between White and Chad Gable. Sydal and Ricochet won with the stereo shooting star presses on both young lions. Fine match. Mostly just a platform to put Lethal over as he’ll more than likely be on the ROH tours next month. Martini got involved at one point. Robison looked like he was going to punch him but Lethal did a big suicide dive, sending Robison crashing into the guardrail. This looked great the way they shot it. Martini got involved again toward the end, looking to hit Robinson with the Book of Truth but Robinson gave him an airplane spin. Lethal recovered and hit a cutter from the middle rope, then pinned Robinson with the Lethal Injection. Really fun ten man tag. Lots of the usual New Japan mult-tag spots you’d normally see, but they worked hard and this ended up being fun. Haku was in a lot. He didn’t look awesome in terms of mobility, but looked fine in everything he did, if that makes sense. He gave Honma a piledriver which led to Gallows and Anderson going for the Magic Killer but Honma escaped. Anderson hit him with a stun gun and eventually they were able to hit the Magic Killer and pinned Honma. This makes sense as they’re probably doing a rematch somewhere at the New Beginning shows. Sure enough, Gallows and Anderson put the belts on Honma after the match and indicated they wanted the next title shot. They went over to the announcers where Anderson said they were the best tag team in professional wrestling….just not using those words, as his actual words were not FCC friendly. Intermission. No announcements regarding Fantasticamania but I’d expect something over the next couple of days since those are very soon. Maybe it’s just me, but there have been hints lately there might be something between Yohei Komatsu and Naito. He helped him to the back last night at WrestleKingdom and Naito ordered him to help him enter the ropes here. There was a great spot where everyone was cheering for Naito. He tagged himself in as he got a bunch of chants against Tanahashi, then simply just tagged himself out for the heel heat. Of course, the minute Tanahashi turned his back Naito jumped him. They all got the heat on Tanahashi following that. Dorada looked good here too. Bushi did the red mist spot, low blowed Dorada after Dorada blocked the first attempt and pinned him with the top rope codebreaker. Ingobernables laid out everyone after the match. Evil hit Tanahashi with the STO. All of the young boys were laid out. Kushida came in to make the save but Bushi sprayed him with green mist and all of them beat him down. Bushi took a microphone and said that he wants the next shot at the IWGP Jr. title. There’s that program, and probably something between Tanahashi and Evil/Naito. Interesting in that they had Dorada took the fall here as I thought they’d do a CMLL Welterweight title match during the Fantasticamania shows. They still may for all I know. Seems based on this match they may have moved Omega up to heavyweight. He and Nakamura had some good interactions with one another. The stream was really bad during this match, even in low quality. That was an on and off issue for the last three days that mostly resolved itself after this match, aside from one or two hiccups. Nakamura hit the reverse powerslam and was going for the boma ye but AJ Styles hit him with the springboard forearm. Omega followed with a reverse rana and pinned Nakamura with the One Winged Angel in a big surprise. That not only cements the move to heavyweight but that also pretty much puts him in line for a title shot. Big angle time. Omega and Styles were celebrating when Omega grabbed Styles from the top rope, put him in the electric chair position and laid him out with the One Winged Angel. The rest of Bullet Club came out and separated them like they had no idea what he was doing. 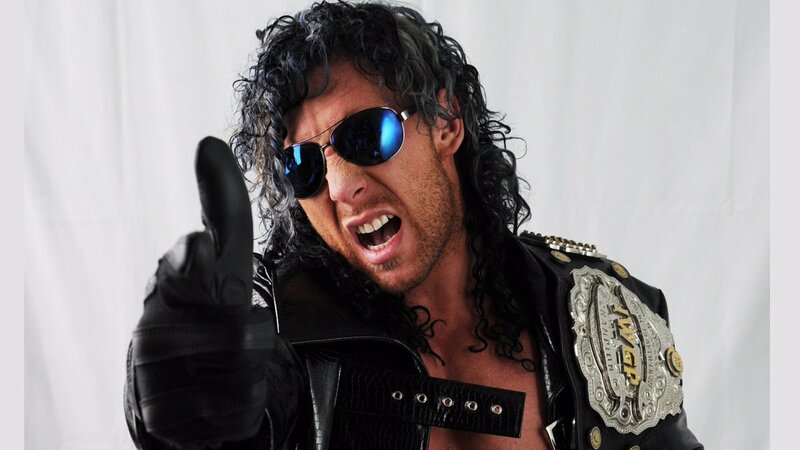 They argued for a bit before eventually everyone giving the Wolfpac sign to one another and put the boots to Styles, effectively putting him out of the Bullet Club. Omega said that you had this coming, AJ. We made you a star and paid you like star. He forced and starved himself to be a junior. Everyone thought you were the boss. You're fired, this is your severance package. He won’t challenge Kushida again, he’s challenging Shinsuke Nakamura. The Bullet Club rules the world, because they are for life...without AJ Styles. The Bullet Club leave like they were going to the back, but Omega and the Bullet Club come back and lay out AJ again, with a double superkick by the Young Bucks followed by a Styles Clash by Omega. They leave for good as the young boys check on Styles. Korakuen Hall starts chanting Styles’ name loudly as he eventually gets up and bows to all four corners of the ring. Great moment and felt like a really nice send off, if it is one. It certainly felt like one. Another fun, action packed match. Usual eight man stuff where everyone worked against their rivals. Tomohiro Ishii and Shibata were in a while and continued to pummel one another. Everyone worked against one another really well and there was a good pace to everything. Goto won the match for his team, submitting Beretta after trapping one of Beretta’s arms while putting the other in an armbar. Goto grabbed the mic after and challenged Okada for the title. I figured as much when Goto won last night. They haven’t done this match in a while, but the problem is Goto has had so many chances at the title I very much doubt anyone would take a title match seriously, though I guess the match will be good enough regardless. Okada seemed to accept the challenge while also mocking Goto for losing the Intercontinental title, as Goto previously challenged Okada while he was still champion and wanted a unification match. Okay main event. Wasn’t designed to be awesome but that’s fine. A lot of Yano antics here. Briscoes hit the Doomsday Device but Matt got on his feet and laid them out with superkicks in a pretty cool spot. They went for the Meltzer Driver but Yano took down Nick. Jay Briscoe hit the Jay Driller on Matt and Mark followed with the Froggy Bow to mark their first successful defense of the titles.